When I click show server I receive XML request error: OK (200) "The server didn't send back a proper XML response" and it shows an incomplete xml directory. The number of archives of the directory file is 403, in the directory image there are two archives and they work well, FCKeditor 2.2 worked well after updating takes place the error. As I can solve the error? Could you set error reporting in PHP to E_ALL and enable display_errors (or log_errors)? Then test PHP connector via file located in editor\filemanager\browser\default\connectors\test.html (in FCKeditor 2.4) to find some more information. I set error reporting in PHP to E_ALL and enable display_errors, but referred errors are not this problem, with Mozilla Firefox the error does not take place, takes place with MS IE 6.0 sp2. I have solved it renaming archives and subdiretorios that had accents in the names. 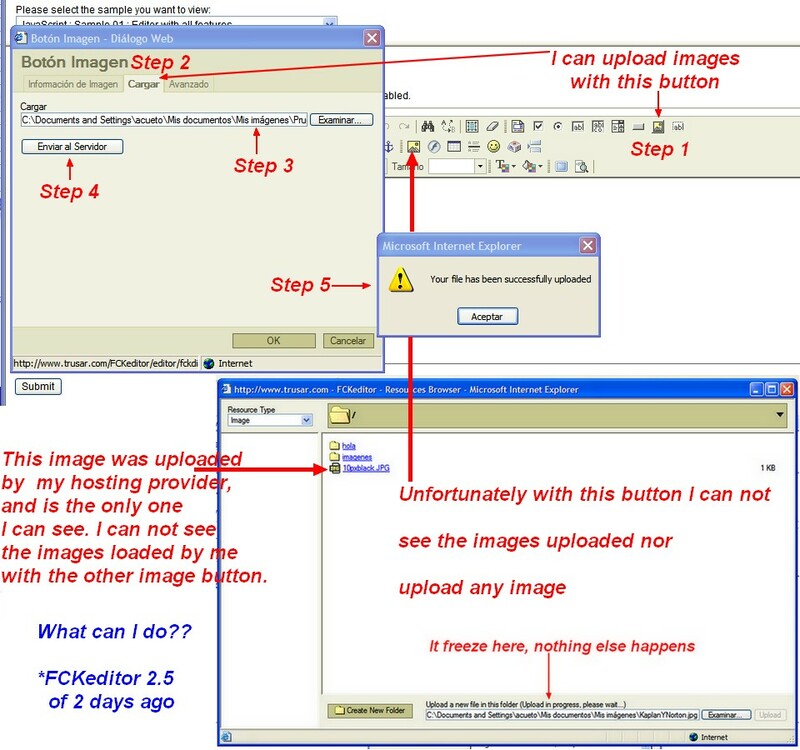 Hello I downloaded today FCKeditor, unfortunately the file manager does not work, neither on firefox nor on IE. But I still have same error. Can any body help me to find the solution? What's your $Config['UserFilesAbsolutePath'] and $Config['UserFilesPath'] path? the message never clears and the image never gets uploaded, I can create subdirectories, but I can not upload images, the directories are empty, permissions are 777. Do you have any Idea of the solution? Just to be sure - does this folder have permissions set to 777: /home/userofdomain/public_html/imagenes1/ ? If this folder has the right permissions, you could enable error_reporting to log file and check for example whether you web server can save uploaded files to temporary directory. Hello wiktor, I appreciate a lot your help. Could you paste here part of your config.php file? I haven't tried to reproduce that behaviour on my computer, but I think that the problem lays in config.php. images uploaded in step 1-5 will be saved in $Config['QuickUploadPath']['Image'] that points to $Config['UserFilesPath']... that's why uploaded file is not visible in resource browser (although it has been uploaded and you can see it when logging via FTP, right?). not that $Config['QuickUploadPath']['Image'] and $Config['QuickUploadAbsolutePath']['Image'] has changed. After that make sure that path to Image resource type is writable by web server. Hello and sorry to bother you so much, but I have a head ache with this now. This is the full config.php file with your changes. Sorry but this does not work for flash or text files either. The images directory '/imagenes1/ is 777 does this means to you that, it is writable by web server? Important Note for PHP with Safe Mode activated: You'll have to create /UserFiles/File, /UserFiles/Flash, /UserFiles/Image and /UserFiles/Media in order for the filebrowser to work. Of course, you'll also have to set the correct permissions for these directories. Furthermore, don't use the "Create new folder" button. The folder would be created but couldn't be used (Safe Mode restriction). So... create manually 4 folders: imagenes1/file, imagenes1/image, imagenes1/flash, imagenes1/media and chmod them to 777. If that text is correct and any folder created by PHP in SafeMode can't be used later to upload files, do you think that it would be better to detect that Safe Mode is enabled and in that situation refuse to create any folder in the connector giving a message explaining that it must be done manually so it can work? Hello, I checked, is a shared server and safe mode is Off. Any way I did what you recommended: I created manually via FTP all the 4 directories with 777 I changed the config.php accordingly but the filemanager only allows to choose Image on the upper left side Resource Type and nothing can be uploaded via FCKeditor. But if I upload files with FileZilla FTP, The File Manager allows to see them and select them and place them inside the textarea. I uploaded via FTP a .swf to the flash directory, but I can not select any directory, it only sees the image directory (Image).